the deer skeleton have movement directly on the skeleton, differently from all the other vanilla skeletons. 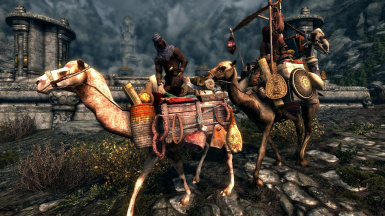 i saw too that sometimes you will find the camel, and not the pedlar, and the contraty too, this happens because they founded enemies in the world and start a fighting, the camel runned and the redguard continued there fighting, and are now trying to find the camel again. you can ask: why you dont put the redguard settings to run too? its easy, if i make it run from battle, they will jump from the camel too and start run separately. the last option is to make both ignorate combat, this means that dragons, giants, wolves, will attack them on road and they will do nothing and don't take damage. i tought about it, but them i came to the conclusion this is not be lore-friendly at all, but you choose, want that? same for the guars and their merchants, i can turn them essential and make them ignore combat, and no more you will find the creature without the rider. community needs to understand that we modders can't do all we want, we deal with limitations, big limitations, specially on AI and creatures, and when you find a thing that makes you think "No, mihail should have done this other way", i probably have attained this conclusion too when doing the mod but was not possible, or cause a lost on immersion, as i've stated before, im not stupid. Hi, really enjoying this, but the two new outfits aren't showing up when I equip them. the new headwraps are fine just the outfits.?? Can anyone write me both peddler's reference id? They sometimes seem to have vanished somewhere, so I can not find them running back and forth between Markarth and Whiterun or Whiterun and Bottom-of High-Hrtothgar, and I would like to peek, where exactly do they stray with player.moveto command. A bit late, however, https://www.nexusmods.com/skyrim/mods/76051. Should help you out. 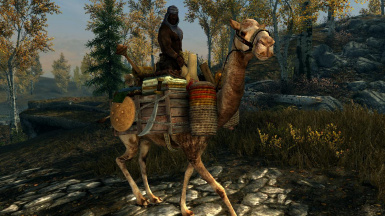 Love the mod, hoping you'll add the camels as proper mounts soon, though. Any ETA on that? Also making them compatible with horse inventory would certainly help make them a viable mount choice. 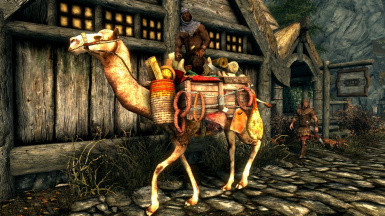 Anyone know why this mod removes merchant factions for the Khajiit caravans? 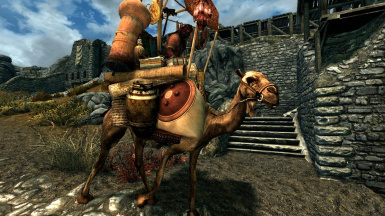 @ Shawn, to see if its this mod simply not playing nice with another mod, first try load order shift, and move this down close as you can near to the bottom, and if you want to try, just for testing purposes, you try disabling this mod next time your near a khajiit caravan group, make a save first at the group , the come out disable it ,. see if it actually this mod that part of the problem, .. I was using Tes5Edit and saw the faction change in this mod. That's why I asked why it was done. I'm not using the mod anymore for other reasons, so it no longer matters. hey since it seems like you are german: ich kenne mich mit modden nicht sonderlich aus, aber ich finde es toll, dass du ihm hilfst! sehr tolle und liebe nachricht. ich hoffe und denke, er weiß das zu schätzen! hat er schon geantwortet per PM vllt? wäre super, wenn das echt klappen würde!!! und vielen Dank für deine Mühe! Mihail is very busy doing awesome stuff, but he will update the mod with the new esp when he has time. So please be patient. Und danke für Deine freundlichen Worte. Tasheni, would you please, share your edition of Mihail's mod with me? It seems that Mihail is too busy, I will upload it the next days myself. 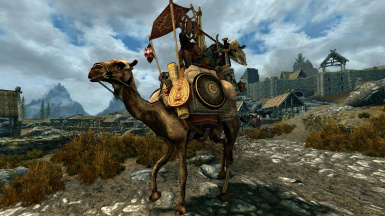 I must admit this mod is super cool, although I've never seen both a mount and a pedlar same time, same place - camel does its routine looping between Whiterun and Markarth, while the Redguard fellow abruptly emerges in different places, mostly settlements, like Ivarstead, where he can stand still as if been confused or frustrated with something (I even know with what) for quite a while and then gets alarmed and starts running to and fro, untill at last he would find the road and run away, never catching up with his mount. A sad story, I should tell you. So, I am at a loss as to should I give it up with that or just take it easy, because the animal itself is so gorgeous. I tried taming it, actually making it a follower with FLP. It's so fun with this wonderful animation it performs. Deer's skeleton palys nicely on a camel, even better than on a deer. The camel looks so vigorous and smart while being an FLP campanion. A bit too loud sound tho, I can't stand it for more than a half an hour (BTW I retired from using Racoons mod for the same reason). So, I did read the sticky post from Mihail. But I still hope simething could be done with the mount/pedlar package synchronization. Should they wait for each other once at a destination, say, the camel reaches Markarth, and woun't depart untill the pedlar mounts it. No? Not possible? Hey Mihail… great work as always. I see some people freaking out about some bugs in this... but I also see your post here where you listed the dropbox post on changing the esp with the fixes. It's a little further down so if anyone needs it then it is listed there. Though, when you get some time think you could add that file to nexus for easy download please good sir. I know your busy and more often than not many people here can be... harsh. But, we do appreciate the work... just asking since it would make things on our end easier with the fixes either patched into an update... or easily downloadable from the nexus page. Anyway... great work as always and can't wait to see what else you cook up next. Mihail, it would be great if you'd fix your lovely mods and check all of them for errors in TES5edit, so we could merge the ones we like ourself without problems. - ArmorAddon / 00redguardheavyshield1 / Female World Model from Weapons\Ebony\EbonyShield.nif to "Mihail Monsters and Animals\Deer\Camel\items\weapons\Ghosu - WP1\Aegis.nif"
- ArmorAddon / 00redguardheavyshield2 / Female World Model from Weapons\Ebony\EbonyShield.nif to "Mihail Monsters and Animals\Deer\Camel\items\weapons\Ghosu - WP1\Aegis.nif"
Shield-meshes for DSR are missing, I'll see what I can do the weekend after next. Thank you soo much bro! I have no clue why he can release literally a mod a week and not fix them? Thank you so much for fixing it!